UNCTAD (United Nations Conference on Trade and Development) organizes every year, the “World Investment Forum”, which is characterized as the pre-eminent platform that brings together businessmen and politicians to discuss issues of investments and development. Organized under the overall theme Investing in Sustainable Development, the “Ministerial Roundtable: Entrepreneurship for Sustainable Development” was addressed by professors, entrepreneurs and politicians, who presented strategies, good practices, and ideas aimed at creating associations to promote the prosperity and to achieve SDGs 8 and 9. The participation of Ms. Amelia Anne Kyambadde who is currently Minister of Trade, Industry and Cooperatives in the Ugandan Cabinet and Ms. Armgard Wippler, Deputy Director General for SME Policy, Ministry of Economic Affairs and Energy in Germany, was highlighted. Ms. Kyambadde presented that young people, especially young women, are the most at risk population due to the lack of job opportunities in different countries, so entrepreneurship has been a key element to support the Ugandan economy. It is not difficult to suppose that “survival” is the main reason that drives them to found their own businesses, because it is the only alternative they have to sustain themselves economically. However, the “precariousness” reflected in these small and medium-sized enterprises (SMEs) is due to the fact that entrepreneurs do not have adequate training, often leaving their studies to execute their own projects. The majority of SMEs in Uganda are independent contractors. Moreover, they often work in specific sectors such as trade, food and housing, whereas their presence in agriculture, fishing, transports and communication sectors is low. “To exist entrepreneurship, there must be a legal framework and an environment for investors, but also for entrepreneurs” concluded the Minister, emphasizing the need to build educational bridges between small entrepreneurs and big companies, without excluding educational institutions because they are especially dedicated to these issues. Furthermore, Ms. Wippler, highlighted that creativity is a key element for the enterprises and SMEs. Universities have a strategic place to foster creativity, which is encouraged in the learning process. Taking this into consideration, Ms. Wippler invited the States to “invest in brains”, that means, to invest in education and research. The goal of this should be to develop the capacity to improve products and technologies, and promote mechanisms to favor innovations, therefore incentivizing international and national investment. This idea shows why about 10 years ago, during the so-called “euro zone crisis”, while most countries announced new cuts for R & D, Germany swam against the current by signing a pact for research, with the broad support of political, economic, and social agents. Undoubtedly, research is one of the cornerstones for economic and social development in the world. 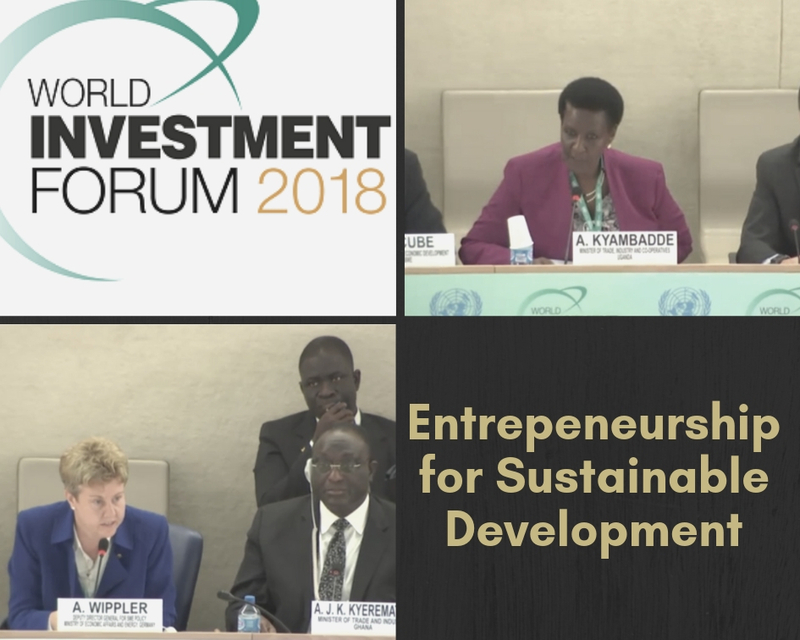 Finally, the directors of UNCTAD’s Empretec, presented the training program for developing entrepreneurship skills, already used in 40 countries since 1988. Its impact has proved effective for a vast range of target audiences in advanced and less developed economies. Empretec has continuously demonstrated high impact by contributing to sustainable development and inclusive growth. “Without investment, there is no trade. Without trade, there is no development” said Mr. Alan John Kyerematen, Minister of Trade and Industry of Ghana who moderated the round table. To this statement, I would add the fact that “without youth, there is no development”; because young people posses a new vision and capabilities that can help governments analyze problems and find solutions to promote and protect human rights. Therefore, it is important to encourage collaborative work between companies and the educational field; a collaboration which should favor a greater insertion of students in the workplace during the training period. This strategy combines the teaching and learning processes Moreover, it develops mechanisms and practices that employ young people, and incorporate them into the independent or salaried labor market.